We can answer these questions and get a better feel for the robustness of the Strategy using the Monte Carlo-Lab add-on to run hundreds or thousands of Portfolio Simulations using all of the trade candidates’ raw data from Wealth-Lab’s single $imulation. We performed 1000 such simulations using MC-Lab options to scramble the trades while maintaining “date clustering”. Our results from a 5-year simulation (ending 11 April 2008 with 200 lead bars) are shown in the distributions of Figures 1 and 2, which tend to indicate that Wealth-Lab’s [single] Portfolio Simulation results represent typical performance. Figure 1. (top) From the Net Profit % distribution of 1000 simulations, we can see that we had 50% chance of achieving an avg. net profit of at least 63.75% and 100% chance at a net profit of at least 16%. Figure 2. 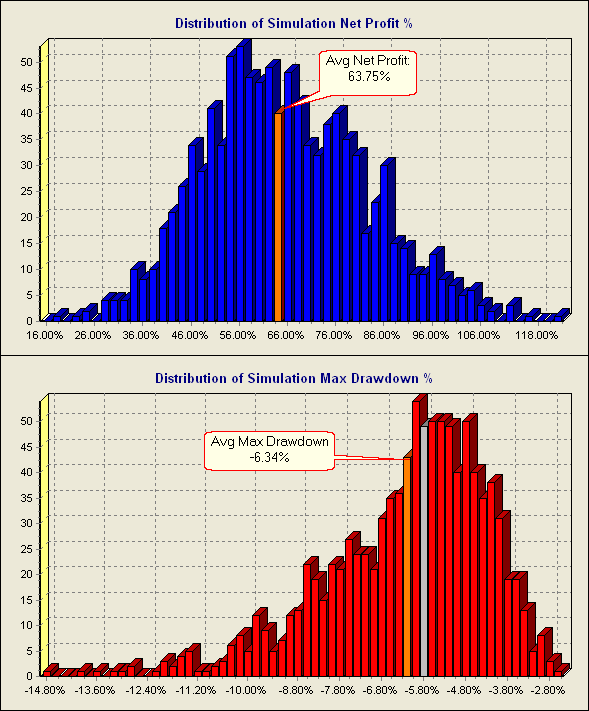 (bottom) The Max Drawdown distribution of the 1000 simulations shows an average drawdown of just under -6%.